This is a page dedicated to the music that reminds us of New Moon! 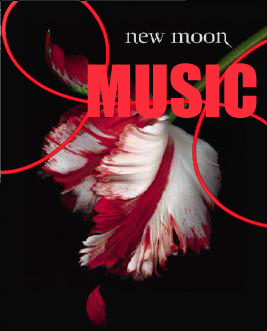 Also to see Stephenie Meyer’s playlist for New Moon, click here! YOU HAVE TO PUT The last day on earth by Kate Miller-Heidke it suites bella story so well and the lyrics fit SO WELL!!! MUST HAVE!!! Train in Vain by Annie Lennox is perfect from Bella’s POV…it’s a bit old school but the lyrics are great – even talks about keeping wolves at bay. “Howl” by Florence and the Machine. I saw them in concert @ St.Louis a couple months ago and when I heard this song I instantly thought of Edward and Bella. Hey, Check out ADAM LAMBERT’s “Time for Miracles” from film 2012. I can totally seeing Edward singing this to Bella when he left her in New Moon but also as he is trying to redeem his actions in Eclipse! Check it out! It will give u chills! I think most of Secondhand Serenade’s songs should be there. I was real emotional reading New Moon, and the music was playing and it fitted just perfect. “The world is not yours for taking,” is all you ever say. ‘Cos if I watch you go you’ll see me wasting, you’ll see me wasting away. Because today, you walked out of my life. Today, your words felt like a knife. That song seems to sum it up very well for Bella. i love this movie.i love the way Edward and Bella protect each other. Edward is always there for saving Bella and i like it. I think ‘Umbrella’ by Rihanna should be added. It explains how Bella and Jacob were there for each other. I think you should put When it Rains by Paramore as well. how about “Please Forgive Me” BY Bryan Adams………. it explains why he left her in forks alone!!!!!! i thought it was quite perfect from Edward’s POV……..
Alot of David Gray’s songs would fit. Almost Lover by A Fine Frenzy would suit Bella and Jacob. Log in | 52 queries. 1.110 seconds.